Glenn Mayer was born on November 20th, 1915. His parents moved from the window-glass producing regions of Charleroi and Namur in Belgium in their teens, and eventually settled down in Mt. Vernon, Ohio where Glenn worked with his father and brother as a glass cutter at Pittsburgh Plate Glass Company. 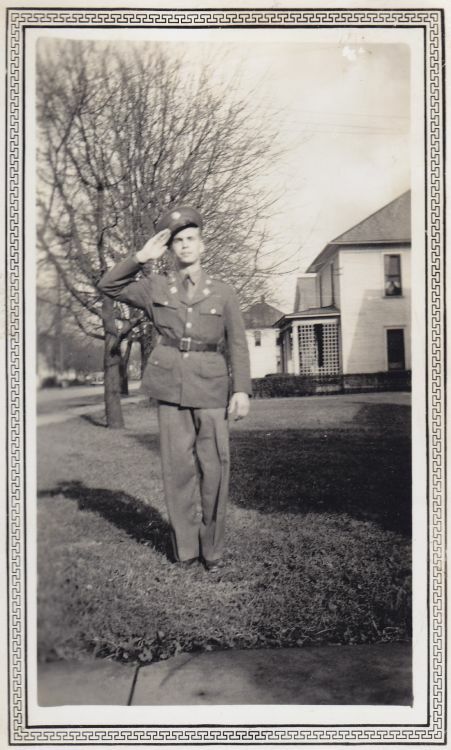 On August 6th, 1941, Glenn was inducted into service at Fort Hayes, Ohio. He was 26 years old then and considered himself an “old timer” among the younger recruits. Little did he know that he would be a part of the forces that later would liberate his parent’s homeland regions in Belgium. 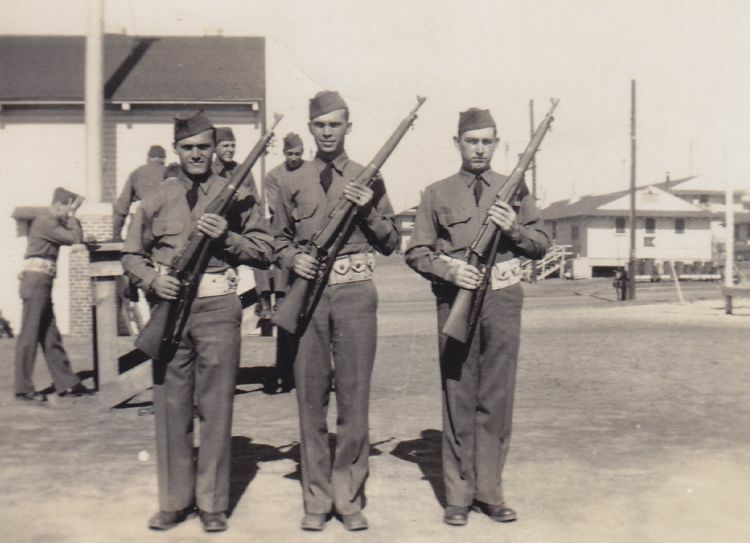 Corporal Mayer began his training at Fort Bragg, North Carolina, new home to the largest artillery post in the world and the new Ninth Division. Here he qualified as a rifle sharp shooter and heavy machine gunner. 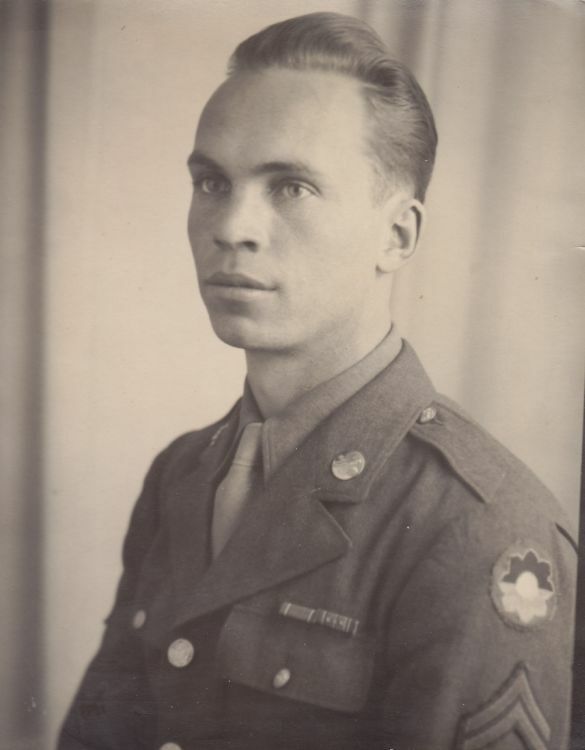 When Glenn went to war for the first time, he would serve as a heavy machine gunner in Operation Torch in North-Africa and Tunisia, fighting in the battles of Port Lyautey, Thala, Maknassy and the Sedjenane Valley. Glenn said that the Maknassy battle was the worst experience of the four. A few months later, he landed at Licata in Sicily, writing home later that “Sicily sure is rough. I thought Africa was bad, but Africa is as much like Sicily as Indiana is Pennsylvania.” He returned to England from Sicily, and in 1944 he landed in Normandy on D-Day+4, participating in the Normandy and Cotentin Peninsula campaign and continuing with the battalion into Germany, Belgium and back to Germany again. Glenn was not a hero nor the “outstanding soldier” as defined by Captain Joseph Mittelman in Eight Stars to Victory, but he was a solid soldier, a soldier’s soldier, and a good man. He made private at least twice and would have preferred to remain at that rank, but prior to Operation Torch when his battery commander told him that he needed him, he proudly took his rank. 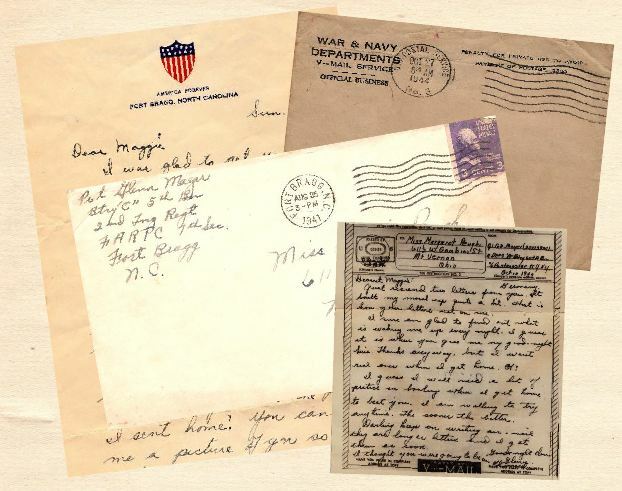 Although he hadn’t spoken to his family about the war, he had written over a hundred and forty letters during the war to the girl, Margaret Elizabeth Peugh (Maggie), who would become his wife nine months after his separation from the army in September, 1945. He married Maggie in May of 1946 and remained married to her until her death in 1971. Some of the many letters Glenn wrote to his future wife, Maggie. After working at Pittsburgh Plate Glass Company again for many years, Glenn retired from there and went to his summer cottage in northern Ohio and his winter home in Orlando, Florida. This is where he spent his days fishing and enjoying his children and grandchildren. Glenn Mayer passed away in 1984 at the age of 69.